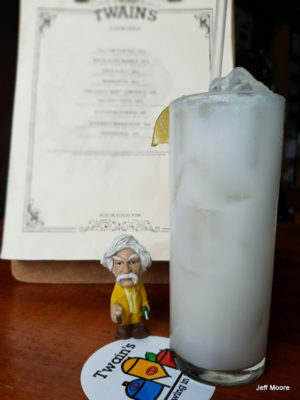 Old Fourth Distillery took home top honors at the 2019 San Francisco World Spirits Competition…. We start with regionally grown sugar cane, a minimally refined turbinado. Our choice for this as our base was made for several reasons: it is non-GMO, renewable, environmentally sound, gluten and pesticide free. Also because we are located in an urban area we needed something we could convert to alcohol with no waste. Our only by-product is pure distilled water. 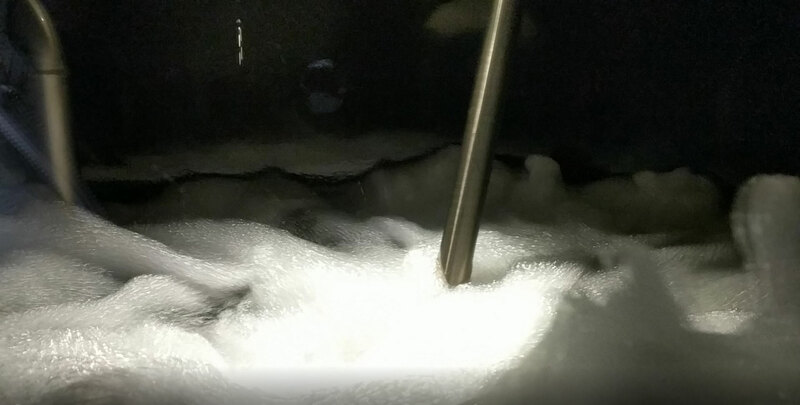 We process our vodka through our state of the art CARL still. CARL has been manufacturing distillation equipment for 130 years. Distilling our spirit 3 times gives us a neutral vodka with a hint of sweetness. Our gin is distilled from organic Italian wheat and vapor infused with fresh botanicals. We wanted a dry neutral base to let the botanicals shine through. We use locally sourced ingredients for our traditional Gin with a twist. We start with Juniper berries, Grapefruit, Lemon & Orange Peel, followed by Cardamom, Pink Peppercorn, Angelica root and Coriander. we distill it to 94 proof for a bolder experience. We are very excited to present this one-of-a-kind Southern Dry Gin. When we first opened in 2014, we made a promise to each other that we would never stop experimenting. We've made a lot of liquors along the way: absinthes, whiskeys, peppermint schnapps, pink peppercorn vodka, even wasabi vodka. Our favorite is a concoction that begins with our cane sugar vodka. We vapor-infuse it with fresh lemon peel, fresh organic cold-pressed ginger juice, and the slightest hint of sweetness from the same cane we use to make our vodka. 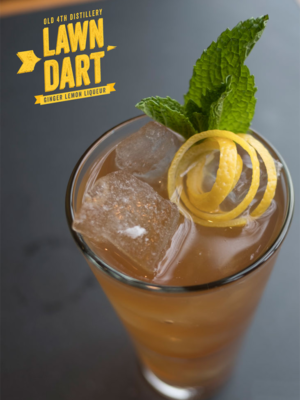 We call it Lawn Dart because it's just a little bit dangerous and a whole lot of fun! Old Fourth Distillery is proud to present this one of a kind whiskey. We hope you will enjoy our contribution to a timeless American classic. This straight whiskey; unfiltered, bottled from a single barrel, limited to a 2019 release of 75 barrels and made from a traditional mash bill. It’s complex taste of chocolate-cocoa swings into a sweet, sappy oak, rich harvest corn and sun-dried hay. Hints of fruit linger in the background. Bottled-in-bond or bonded, is the product of one distillation by one distiller at one distillery. It must have been aged in a federally bonded warehouse under U.S. government supervision for at least four years and bottled at 100 (U.S.) proof (50% alcohol by volume). Enter your Zip Code below to find all of the great places carrying O4D closest to you. Add vodka, lemon juice, simple syrup, coconut milk to a shaker with ice. Squeeze in the 3 lime wedges, shake until chilled. Strain into a highball glass over ice, top with ginger beer, serve with a lime wedge. – Combine all ingredients over ice in a Collins glass. Garnish with a lemon wheel and fresh mint. 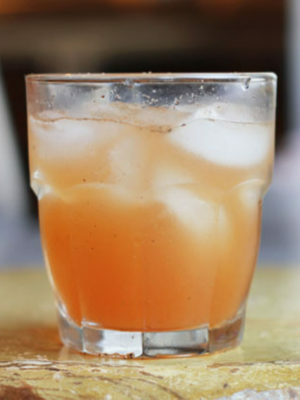 – Combine vodka, campari, grapefruit juice, and black pepper syrup in a cocktail shaker with ice. Shake and strain over a large cube in a highball glass; add a few dashes of angostura bitters over the top. 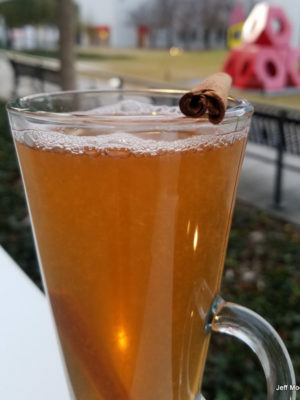 – Combine vodka, cider, shrub, and syrup in a cocktail shaker with ice. 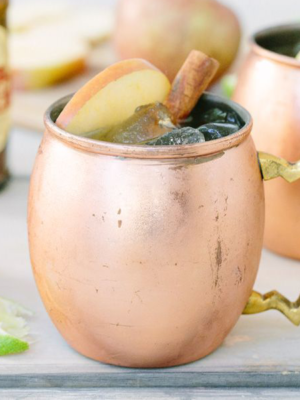 Shake and strain into a mule mug over ice, top with a splash of club soda. Have a local opportunity or just can’t find what you’re looking for? We would love to hear from you - you can use our contact form or shoot us an email at info@o4d.com. I use my extensive business background and knowledge to bear to tackle some of the logistical, financial and administrative challenges that owning a distillery inevitably brings. For everything you see on the surface, there are dozens of tasks going on behind the scenes. I like to think of myself as a a facilitator to help bring out the passion and creativity that Gabe and Jeff bring to the table. Aside from my duties as an executive, I enjoy being the head of the mash and fermentation processes and I have a passion for bringing new spirits to life at Old Fourth Distillery. Broder is a distiller, fermenter, tour guide and a general go-to-guy for whatever the distillery needs. He first came to the distillery to volunteer on a bottling day and couldn't get enough. He kept coming back and eventually became a tour guide for the distillery. He and his brother have both worked under Gabe Pilato, so it was a natural fit that he would be mentored and trained by someone close to the family! Broader enjoys drinking beer and seeing local concerts in Atlanta. Jamison originally came to the distillery to volunteer with us. He kept coming back and eventually starting working for Mooring Tech, a company across the street from the distillery that is owned by the Moore brothers. He still gives tours from time to time and helps us on volunteer days when he isn't busy at Mooring Tech. Jamison loves Dave Matthews Band, craft beer, and camping with his family. Head of marketing, distilling and plant operations. In addition to these functions at the distillery, I am also in charge of ordering t-shirts in many sizes and colors and creating many failed spirit concoctions. Creating a distillery has been the most rewarding endeavor I have ever been a part of. I love to come to work every day. Even if that day requires me to clean the floors and fork lift sugar. Learning the art of distilling is an ever evolving challenge. Knowing that my kids will one day take over this business makes me so proud and humble. Jessica Luna is our head of sales and works alongside our distributor to make sure the world can get it's Old Fourth Distillery fix! Luna hails from Florida and has been living in Atlanta for 8 years. After spending some time in corporate america, she decided it was time to shake things up and when she was presented with the opportunity to become part of the O4D team it was a natural fit! Luna is an extremely talented baker and uses her cooking skills to come up with some delicious cocktail recipes! Old Fourth Distillery was started by 2 Bothers who decided to open Atlanta's first distillery since 1906, taking a neighborhood centric sustainable approach to creating the finest spirits available at any price. We use sustainable non-GMO sugar cane to make our vodka, using less energy and creating zero waste. Old 4th distillery’s only byproduct is pure, distilled water. Our cane sugar base and hands on approach creates a naturally gluten free vodka with a soft, round mouthfeel and a subtle caramelized sugar aroma. Our Southern Dry Gin is vapor infused with only the finest fresh botanicals. Every bottle of O4D is made by hand in our 1100 square foot distillery in the Old Fourth Ward. Three people create the fermentations, do the distillations, bottle, and package every drop of our signature vodka and gin. We use a custom, handmade CARL copper still. At Old 4th Distillery we strive to make the world’s finest spirits using only the best ingredients available with cutting edge technology and centuries-old traditions, support our community, local artists and musicians; and we are always looking for opportunities to give back to the city which has given us so much. We strive to be environmentally active and responsible, utilizing sound environmental practices whenever possible. We hope you will enjoy drinking our fine southern spirits as much as we enjoy making them.